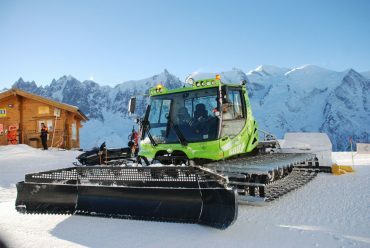 This season, the Compagnie du Mont-Blanc is investing in a new tractor-mounted chop machine with electrically driven blade and drill, totally hybrid. This machine, of which only two or three models are in current operation in French stations, will be tested in live conditions throughout the winter. The PistenBully 600 E +, the first “hybrid” electric diesel hybrid of the market is a true energy and environmental revolution in the field of grooming. The KASSBOHRER branded machine which costs about 50 K than a “classic” craft is part of the environmental guideline that the Compagnie du Mont Blanc has set itself for several years now. It is on this theme that this winter will be created, in collaboration with the company Ho5 on the site of La Flégère, an original play area themed around the legends of Chamonix. More than a sliding experience, skiers will be immersed in a unique universe where stories, heritage, magic, sharing and discovery will take place. The area will highlight several legends in order to offer many marvellous experiences. On the trail of Les Evettes, there will be a snowy village all the winter, animated by popular characters. Discoveries, challenges, treasure hunts, magic itineraries, puzzles … a whole world of animations to discover!